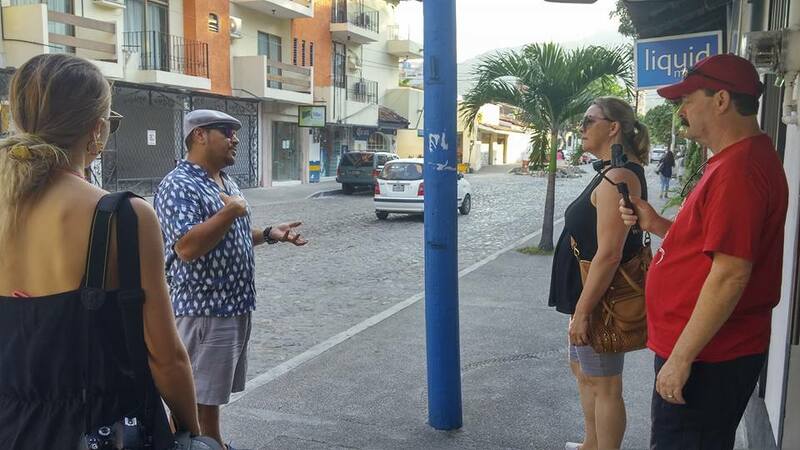 Starting in the city square in old town Puerto Vallarta near the River Cuale, our guide Lobo from Vallarta Food Tours greeted us with enthusiasm. 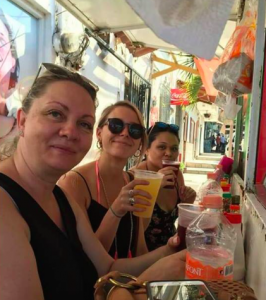 Not only were we about to eat a bountiful amount of tacos for breakfast, but also try REAL authentic Puerto Vallarta street food. 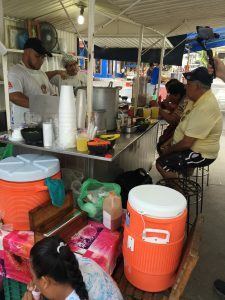 It is rare to find a traveller at a corner food stand, tourists usually opt for American-ized restaurants and food they find familiar and comfortable eating. For us this was NOT the case. 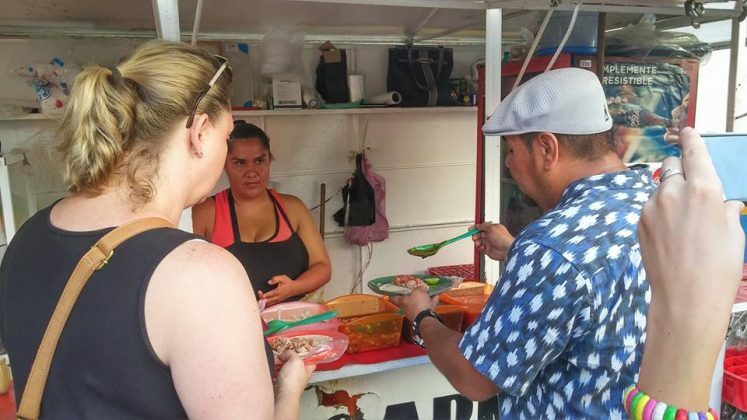 As guests of Tourism Puerto Vallarta we vocalized that if we are to truly experience the artistic beauty and flavours of Puerto Vallarta nestled in the Sierra Madre mountains and over looking Banderas Bay, we want to try authentic food – where the locals eat on the daily. 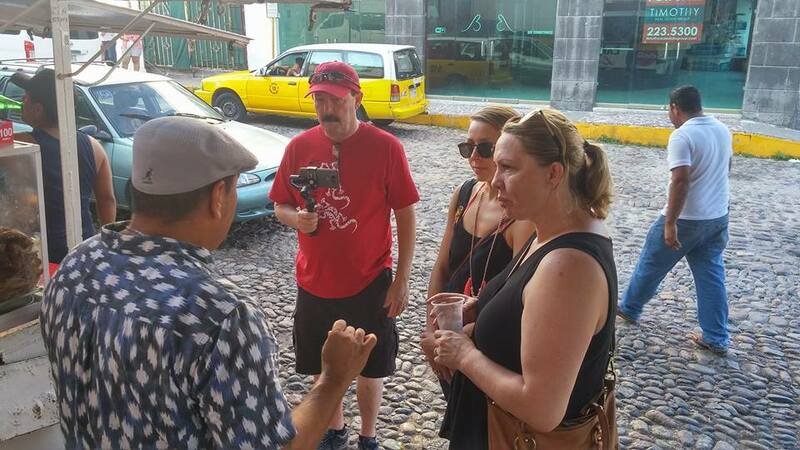 As we embarked on our taco tour walk, Lobo was engaging us with historic and interesting facts about the area – some which surprised us! The first taco stop was not a far walk, but a memorable one. 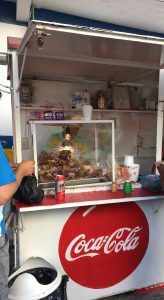 Lobo informed us that the stand opened in 1986. 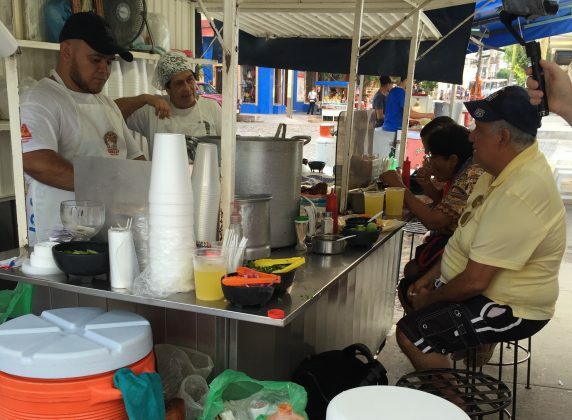 Owner, Filipa and her late husband opened the taco stand and before her husband had passed away, Filipa competed state wide for his infamous dish – this stand has become known for modernizing it. 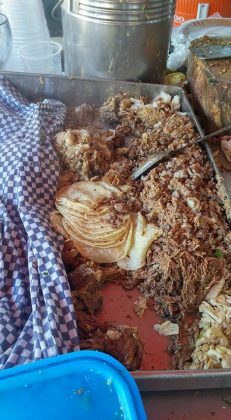 We also learned that the heavy content and savoury shell makes this stop popular for locals looking to kill a bad hangover. As we continue our walk, Lobo chatted about local street art and how they too have a local “Banks” Artist who only works at night, keeping his identity secret. 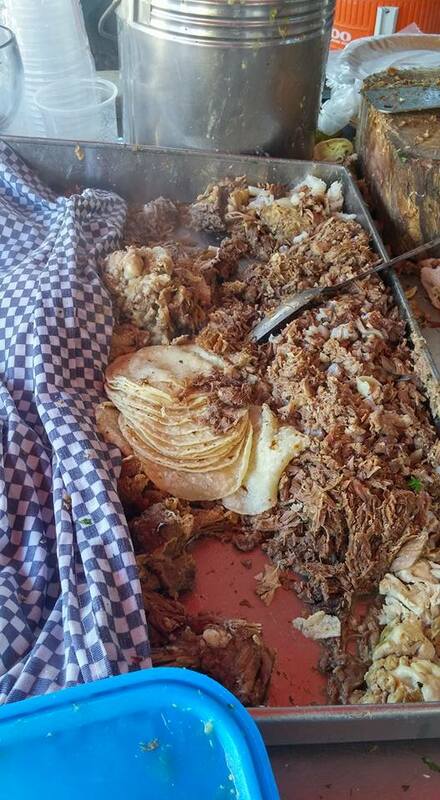 The second taco stand was “pulled pork” heaven. Tenderized pork, fresh corn tortillas and fresh salsas of every heat. 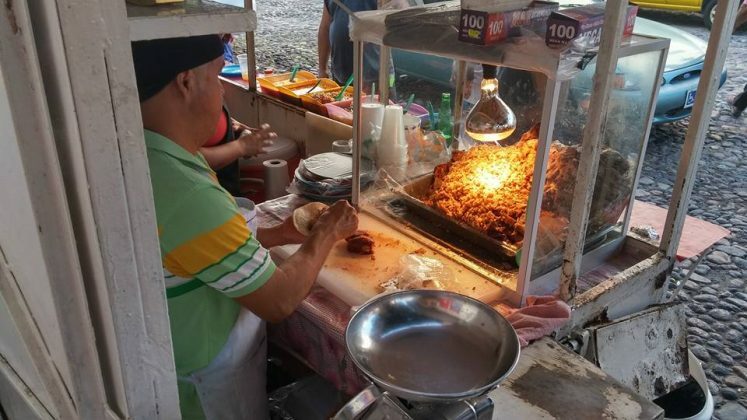 The pork leg was marinated in it’s own broth and served fresh and tender at a mouthwatering temperature. As we inhaled the delicious tacos, Lobo described the difference between heat and spice as well as the top visual points to look for when stoping for street food – clean surface area, clean grill/prep area and well displayed and tidy sauces and salsas. 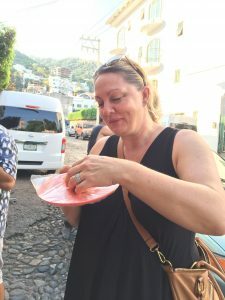 We strolled through the Emiliano Zapata district and Lobo mentioned how at the first Mexican taco stand, pork was imported from Cuba and the corn wrap was born from the result of no baguettes or buns in Mexico at the time. 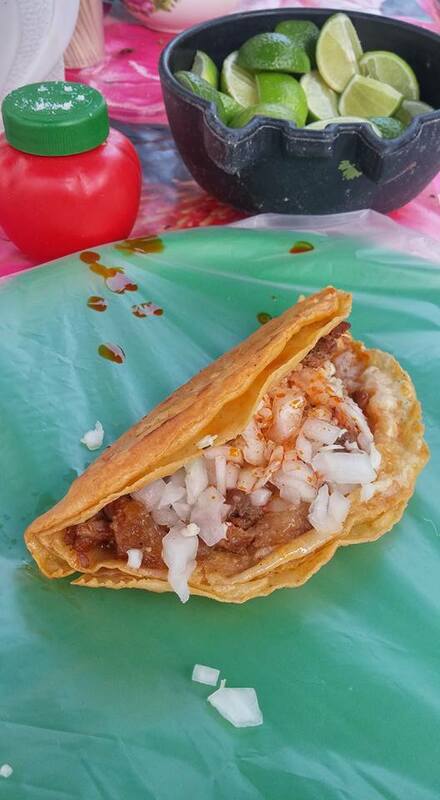 Walking through the Emiliano Zapata market, Lobo sourced out a local cheese for us to try a vegetarian option. 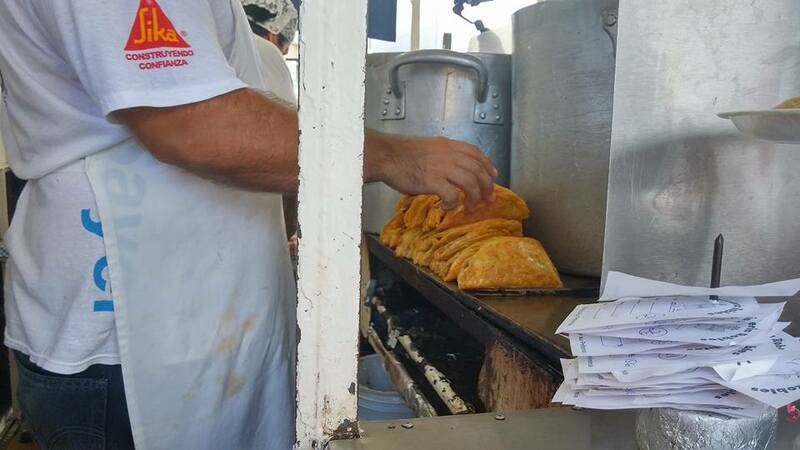 We stopped at a local shop front that was making fresh corn tortillas. Lobo passed out warm shells and the panela cheese, topped with a pinch of salt and this vegetarian option was instantly one of our favourites. As we walked through the market, Lobo pointed out the origin of chipotle and how it’s a smoked jalapeño. During the Aztec rule, the village could not eat a whole jalapeño chilli harvest in one season – so the roasting and preserving began! 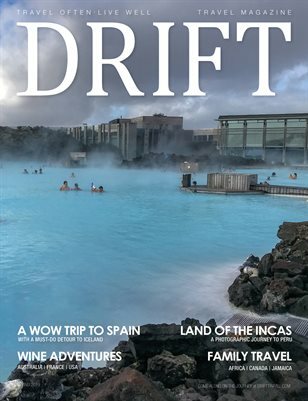 Our last stop was undoubtably our favourite. 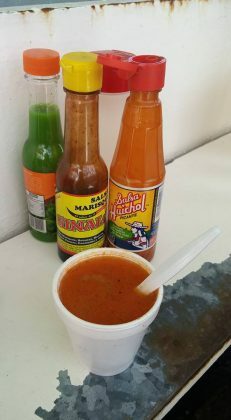 If you have not tried a Marlin taco, I suggest you do…but specifically at Mariscos La Tía – Gasolinera Solorzano Smoked in garlic butter with a chilli rub, the marlin shrinks and becomes the bacon of the sea with a very meaty and hearty consistency. We send special thanks to Gustavo with Puerto Vallarta Tourism as well as Lobo from Puerto Vallarta Food Tours.